Student to teacher rates based on race of each. Denver Public Schools struggles to attract and retain minority teachers, particularly black teachers, mirroring a challenge faced by many urban school districts across the country. The resulting imbalance is striking. White students in Denver are 10 times more likely to be taught by a teacher of their own race than are either black or Latino students, records show. Educators and academics say that having a teaching staff that mirrors the student body’s racial composition makes a substantial, positive difference for kids and schools alike. “(A racially and ethnically diverse teaching staff) is vitally important, not only because it impacts the learning environment for students, but it influences the whole culture and climate of a school,” said Elizabeth Hinde, dean of the School of Education at Metropolitan State University of Denver. Professionals of color have more, often better-paying options open to them than they did four decades ago. Schools and school districts are riddled with “unconscious bias” that make them feel like inhospitable places for minority teachers to work. Relatively few black and Latino students enroll in schools of education, and even fewer graduate. In Denver, black teachers are fired at a slightly higher rate than teachers of other racial and ethnic groups. Last school year in DPS, there were just 241 black teachers, 77 fewer than in 1970, the year the Keyes v. School District No. 1 desegregation case was first decided in U.S. District Court in Denver. The number of black students declined over that period as well, but at a lower rate. This means the ratio of black students to black teachers has worsened, from 44-to-1 in 1970 to 51-to-1 last school year. The ratio of black and latino students to black and Latino teachers in Denver Public Schools has improved over the last 40 years, but remains at about 50-to-1. The white student to white teacher ratio is 4-to-1. South High School art teacher Shauna Twardzik talks to students during an orientation in Denver in this 2011 file photo. Joe Mahoney/Rocky Mountain PBS By contrast Denver’s Latino student to teacher ratio, while still high, declined markedly from 1970, when it was 206-to-1, to 2014, when it was 52-to-1. The number of Latino students in the district soared by 138 percent during that period, but the number of Latino teachers grew much faster – by 845 percent. At the other end of the spectrum, there are four white students for every white teacher in Denver. While these ratios remain unacceptably high for both black and Latino students, district leaders say, the challenge of attracting and retaining black teachers in particular has proved increasingly vexing over time. Still, DPS’ numbers look less bad when compared to other metro area school districts. In Aurora Public Schools, for example, where a higher percentage of the student body is black – 18.1 percent vs. 13.8 percent in Denver – the percentage of black teachers is lower, 3.4 percent in Aurora vs. 4.1 percent in Denver. This means there are 97 black students for every black teacher in Aurora. Other suburban districts have almost no black teachers. Jeffco Public Schools, Colorado’s second largest school district, employs just 12 black teachers, 0.2 percent of the teaching force. The student body in Jeffco is just 1.2 percent black, meaning the black student to black teacher ratio there is 85-to-1. Some critics of the Denver district say DPS pushes out black teachers at least as fast as it can hire them, and district officials acknowledge that “unconscious bias” may play a role in individual decisions in schools that lead to the dismissal of black teachers. The district has embarked on intensive “unconscious bias” training for its central office and school-site leadership. DPS records for the past three years show that black teachers have been fired at a higher rate than other racial and ethnic groups: 6.5 percent of black teachers, 4.2 percent of white teachers, 3.8 percent of Latino teachers and 5.4 percent of mixed race/Asian/Native American teachers have been dismissed over the past three years. Sharon Bailey, a Denver school board member from 1988 to 1995, maintains close contact with district issues in general and with some current and former black teachers in particular. Bailey, who is black, said there is a widespread sense among some current and former black teachers, women in particular, that their contributions have not been valued by the district. “I’ve been contacted by a number of teachers, primarily older African American women, who feel that to save money the district has kicked them to the curb without due process and replaced them with young (Teach for America) types,” Bailey said. Annette Sills-Brown taught in DPS for 17 years before losing her job in 2011. She said she is convinced her union activism and outspokenness about the district’s failures to educate African American students contributed to her dismissal. She sued the district and settled out of court for what she said was a token amount. Whitney Robinson-Johnson, who lost her DPS teaching job in 2012 and now teaches in an Aurora charter school, said black teachers she knows struggle with issues of “cultural competency” among their white colleagues whether they teach in affluent schools with mostly white students, or high poverty, predominantly minority schools. In schools with many minority students and low test scores, the failure of a largely white teaching staff to adequately educate students of color is glaring, she said. But in schools where most students are white and more affluent, minority students are often served just as poorly, but “because the scores are so wonderful, it all gets swept under the rug,” she said. On top of that, Robinson-Johnson said, there is the “internalized racism” that many minority teachers feel coming from white parents. What it all adds up to, she said, is an environment in which some black teachers decide there must be a better way to earn a living. DPS administrators seem eager to acknowledge that the district suffers from ingrained, unconscious bias. They say they are working methodically to identify and eradicate it to the extent possible. Doing this successfully is the only way to attract and, at least as important, retain minority teachers, they say. Officials say they are determined to do whatever it takes to recruit and retain more teachers of color. Last March, the district held its first “Mile High Showcase,” bringing 18 top minority teaching candidates from around the country to Denver for three days, hoping to persuade them to take a teaching job here. 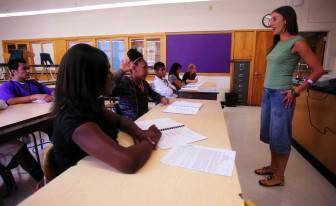 The effort succeeded: 14 of the 18 are now teaching in Denver schools. While all eight Latino candidates signed on, three of six black candidates did so. Now the key is retaining those teachers for the long haul. To that end, DPS is enhancing its efforts, and bringing in new partners. For the next round, DPS is partnering with the Mayor’s Office of Children’s Affairs and a group of local foundations to beef up the showcase and attach a mentoring program that will help new minority teachers settle in and put down roots in Denver. Each teacher will be paired with a civic or business leader of his or her race to help the new hire forge bonds here. The district also has two grow-your-own teacher programs, Denver Teach Today and the Denver Teacher Residency, both of which are creating pipelines of minority teachers for the district. Coupled with these initiatives is a concerted district effort to train its staff in how to work with a diverse group of people, said Debbie Hearty, DPS’ chief of human resources. That means changing the focus of diversity training from the more traditional “understand and respect differences” approach to one focused on the unconscious biases harbored by every individual, Hearty said. “It is human nature to have biases and this does not make you a bad person but you need to be aware of those biases” before you can begin to address them, she said. To date, the district’s central leadership and teams in 40 percent of the district’s schools have gone through unconscious biases training, Hearty said. The next step, she said, is to roll out the training to lower levels of district administration, and to create “internal equity teams” in every school. DPS officials also pointed a finger at Colorado’s schools of education, which Superintendent Tom Boasberg said “are pathetic in terms of the diversity” of their aspiring teachers. State data bears Boasberg out, particularly when it comes to black students enrolled in teacher education. In 2014, just 1.9 percent of enrollees in Colorado’s college and university-based teacher preparation programs were black. Just over 11 percent were Latino, and 72 percent were white. Those number have held steady for the past four years. These numbers helped motivate DPS to create its own alternative pipelines. Hinde, the Metro State education dean, acknowledged that her school and others need to do a better job attracting and retaining minority candidates. But she said there are multiple obstacles, and laying all the blame at the feet of higher education is simplistic and unfair. Hinde said Metro State does far better than most schools when it comes to graduating qualified minority teachers. In 2013-14, just under 23 percent of Metro’s education school graduates were minorities, 17 percent of them Latino. Those numbers still fall far short of the ideal, Hinde said. One issue is that systems Metro and other universities use to evaluate their students may be riddled with cultural bias, which washes out a disproportionate number of minority candidates. But those evaluation systems, she said, are aligned with those used by school districts, so the bias may originate elsewhere. Finally, Hinde said, universities like hers suffer from the same problem as the school districts: A shortage of minority faculty. About 20 percent of the Metro State education faculty is minority, “but that’s not enough.” Hide said she has instituted an incentive program to lure minority faculty, offering a tenure track position and an extra stipend for doctoral candidates who come to Metro to finish their dissertations while teaching a lightened load of courses. 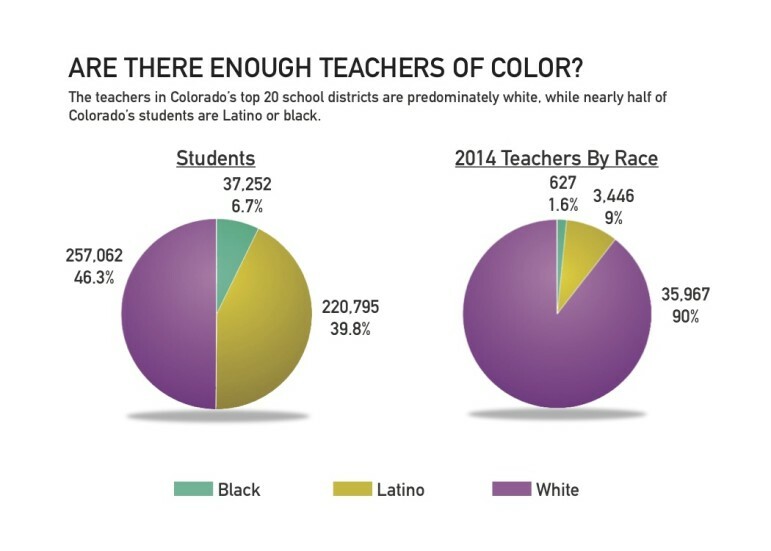 The Denver area is not alone in confronting a dearth of minority teachers. A report released in September by the Albert Shanker Institute laments the shortage of minority teachers across the country. It focuses on nine cities coast-to-coast that are struggling with this issue. But the main problem, the report says, lies outside recruitment. Like Denver, other cities are having more success building the Latino teacher force than increasing the number of black teachers. The report recommends that the federal government and states invest in creating high-quality schools of education in Historically Black Colleges and Universities, and in tribal and Latino-focused institutions as well. Grow-your-own programs, like those in DPS, are also touted in the report. Sills-Brown, the DPS teacher who lost her job in 2011, said solutions need to go deeper than that. “Our society has to respect teachers and it doesn’t. So you aren’t going to get black and brown people to go into a profession where they are disrespected when they’ve been disrespected their whole life,” she said. This is part of Rocky Mountain PBS’ ongoing coverage of Race in Colorado. Standing in the Gap examines race in public education in the state. To learn more, visit rmpbs.org/thegap and watch a special report on Rocky Mountain PBS at 9 p.m. Nov. 12 and 19.